The Sidney Janis Gallery first opened its doors in 1948 and over the ensuing decades became a beacon for some of New York City's most avant-garde artists. Art collector, dealer and businessman Sidney Janis, along with his wife Harriet, swiftly established the gallery's reputation by curating exhibitions of Léger, Mondrian, the de Stijl artists, the Futurists and the Fauves. Beginning in 1952, Janis gave Jackson Pollock the first of three solo shows, further establishing the cultural dominance of Abstract Expressionism. Ten years later, the gallery put on its most famous exhibition, The New Realists. Throughout the gallery's existence, it ably and consistently measured the pulse of the New York art world in showcasing some of the finest and riskiest avant-garde art of the 20th century. Sidney Janis and Harriet Grossman met in New York City in 1925 and were married that same year. The two were equally impassioned by their love of music and the visual arts (he was an accomplished ballroom dancer and she a writer/poet). During this time in New York, there were only a handful of art galleries that offered anything in the way of contemporary art (notably Alfred Stieglitz's Gallery 291), and the avant-garde remained mostly the sole intellectual property of Paris. Not long after settling in New York, Sidney opened and ran M'Lord, a successful shirt company. As the business prospered, the Janis's began taking annual trips to Paris to visit museums, galleries, and eventually started building their own collection of fine art. On these trips they met the Modern greats Mondrian, Picasso, Léger and Brancusi, and by the early-1930s, the Janis's had begun acquiring an impressive collection of these artists' works, in addition to paintings by the Surrealists Rousseau, De Chirico and Dalí. In 1934 Sidney became of member of the Advisory Board at The Museum of Modern Art, along with Alfred Barr and Meyer Schapiro. Janis loaned the Museum 19 paintings from his private collection, which included a number of Mondrian's famous Compositions and some later Cubist paintings by Picasso. Sidney was later appointed as Chairman of MoMA's Acquisitions Committee, and played an integral part in acquiring the loan of Picasso's Guernica, which entered the museum on loan in 1939. That same year, Sidney closed down his shirt company to devote himself entirely to the museum and to art writing. In 1945, View magazine published a special issue devoted entirely to the work of Duchamp (for which the artist designed the cover), in which Sidney and Harriet provided one of the issue's main essays, Marcel Duchamp, Anti-Artist. (The essay was reprinted in Robert Motherwell's 1951 book, The Dada Painters and Poets.) In the essay they wrote that Duchamp's works "are scarcely recognizable as the products of creative activity: they are so unorthodox, and so far removed from patterns, centuries-old, of the material and conceptual substance of painting and sculpture." Perhaps no other artist continually captured the Janis's imagination like Marcel Duchamp. As Duchamp revived Dada in the 1950s, Neo-Dada artists emerged, with their complex celebrations of the "readymade" and popular culture, and paved the way for Pop artists like Lichtenstein, Warhol and Oldenburg. The Janis's considered Duchamp to be the definitive 20th-century artist; the one who best represented the conflict and drama of living in the Modern era. In September 1948, the Sidney Janis Gallery opened its doors with an exhibition of Fernand Léger, which stayed up for a little over a year. In subsequent months, the Janis exhibited an impressive number of shows, including, Piet Mondrian (1949 and '51), Les Fauves ('50), Brancusi to Duchamp ('51), Early Léger ('51), Henri Rousseau ('51), French Masters ('53), and International Dada ('53). Given the Janis's earlier travels to Paris, their vast personal connections in New York, and their own private collection of Modern art, the caliber of art frequently on display at the Gallery was impressive. In March 1962, a de Kooning solo exhibition was mounted at the gallery. By this time de Kooning was a New York legend, and many young gallery-goers attended the exhibit excited to view his work. What they got instead were several small paper drawings, and a few new paintings with his same (and as it turned out to a 1962 audience, predictable) signature, gestural brushstrokes. Following the show's opening, one critic for Art International wrote that de Kooning "has painted himself into a situation in which he can no longer distinguish very well between his hits and misses." The poor showing for de Kooning seemed to indicate for many the end of Abstract Expressionism; several months later the lauded New Realists exhibit opened at Janis, marking the arrival - on a large scale - of Pop art. The Neo-Dada/Surrealist Claes Oldenburg eventually became a favorite at the Janis Gallery. Both in 1966 and 1970, the Janis exhibited solo exhibitions of Oldenburg's sculpture and lithography, further securing the gallery's place as a key destination for avant-garde Pop, New Realist and Postmodern art. 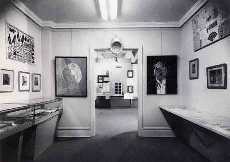 Not long after Sidney Janis retired from his gallery at the age of 91, the Janis Gallery celebrated its 40th anniversary in January 1989 with an exhibit that was very much an homage to the Gallery's initial shows. Displaying works by Léger, Mondrian, Arp, Matisse and Giacometti, the bulk of the pieces on display had at one time or another passed through the Gallery's doors in the previous decades. The Janis Gallery was the first institution in the U.S. to display works by Hans Arp and Robert Delaunay, and the first to offer a comprehensive retrospective of Henri Rousseau. More importantly, by giving the eminent Marcel Duchamp a venue and opportunity to re-emerge and resuscitate the Dada movement, the Janis became the stage for announcing the arrival of Pop art on a large scale. As New York art went from obscurity to prominence in the 1940s, and witnessed drastic changes over a relatively short period, the Sidney Janis Gallery was the sun around which other planets orbited. Exhibit became renowned for showing Abstract Expressionist artists such as Pollock, de Kooning and Gorky alongside many of the great European Modern "masters," including Dubuffet, Arp, Picasso, Matisse and Kandinsky, thus ultimately confirming Abstract Expressionism as a movement of equal importance in the annals of art history. This was the first large-scale show of Pop art, placing American works alongside paintings from Sweden, France, England and Italy. The works were presented in such a way that gallery-goers could trace American Pop art's brief history back to the European Nouveaux Realistes, which included Jean Tinguely and Yves Klein. In an introductory note for the show, Sidney referred to these artists as "factual artists," suggesting they collectively signified a new phase in artistic representation, and were part of a new cultural context. Among the works on display were Lichtenstein's Refrigerator, Thiebaud's Salad, Sandwiches and Dessert, and Warhol's 200 Campbell's Soup Cans. Time magazine dubbed these artists the "Slice of Cake School," indicating their fascination with supermarket culture. In protest of the exhibition, Mark Rothko, Adolph Gottlieb, Philip Guston and Robert Motherwell all resigned from Janis Gallery. "I like you because you are not interested in only one kind of art"
"Painting in New York does not perhaps have the elan that it had ten or fifteen years ago, but it is not for lack of encouragement by dealers like Sidney Janis." "Overnight, it seemed, the art world changed. My father was in despair over the selling of art, over the slick, depersonalized gloss - not only of Pop art, but of Minimalism as well - that was taking center stage in New York. 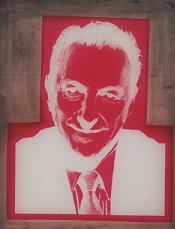 Art was no longer struggle; art had become marketing." "I tried to induce them to stay, explaining that the younger artists could not be considered competitive, but all in vain. As disturbing as it was, we continued with the Pop generation, which in the meantime has made its own reputation. Incidentally, Bill de Kooning was one of the artists who attended that fateful meeting. I later heard that he offered no protest. He was the only one who stayed with the gallery. I always felt that Pollock and Kline, both of whom had died, would have remained as well."